“Ang martial law ay hindi lang [namin] tinututulan sa Mindanao, bagamat sa Mindanao dineklara ang martial law dito sa buong Pilipinas ay may de facto martial law,” said Bishop Antonio Ablon spokesperson of Barug Katungod. 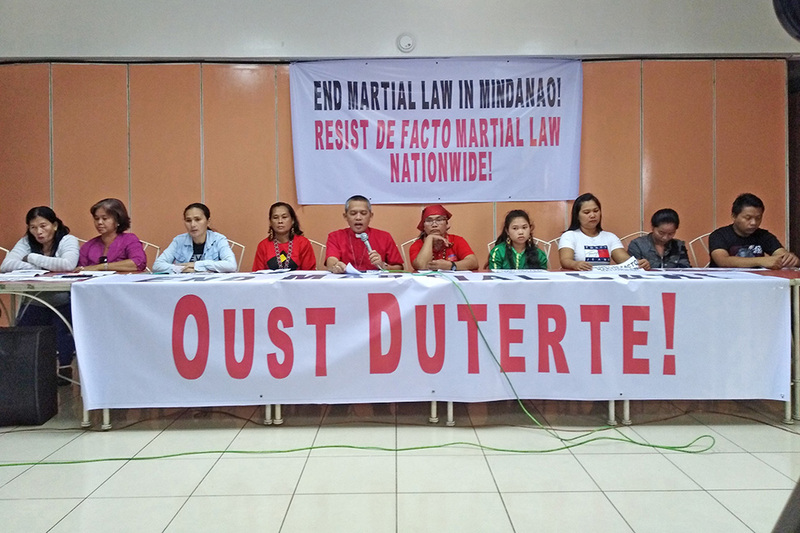 The speakers in the press conference held today said the prolonged martial law caused a lot of cases of human rights violations in the first two months of the year. They also said number of leaders from peasant groups have been killed, while there are 11 activists who have been arrested and detained on trumped-up charges. Victims of martial law in Mindanao are in Manila, as well as displaced Lumad children holding their ‘bakwit school’ in various venues in Luzon since June 2018 and striking workers from Sumifru plantation who have been violently dispersed in their hometown have sought refuge in Manila since December 2018. A lumad bakwit student stated that Lumad schools were closed, destroyed and some occupied by military personnel. “Kami po kabataang [lumad] uhaw makapag-aral, humingi ng tulong sa [gobyerno] pero hindi kami binigyan. Kaya nagsikap mga magulang namin para makapagtayo ng paaralan pero ang ginawa [ng militar] sinunog nila,” said Rosalyn Magon. Speakers also decried that church people, journalist, and lawyers are also being red tagged and being labelled as “CPP-NPA supporters” or leaders. The victims, including the human rights defenders, called for an end to martial law in Mindanao and to resist de facto Martial law nationwide. The Supreme Court decision affirming the third extension of martial law in Mindanao was announced a week ago on February 19. Voting 9-4, only Associate Justices Antonio Carpio, Marvic Leonen, Francis Jardeleza, and Alfredo Benjamin Caguioa dissented. The decision dismissed the petitions filed by 4 different groups: minority lawmakers led by Albay Rep. Edcel Lagman, lawmakers from the Makabayan bloc, human rights groups led by Constitutionalist Christian Monsod, and a group of Lumad teachers and a student from Mindanao. SC also upheld constitutionality of President Rodrigo Duterte’s 60-day martial law declaration from May 23, 2017 and its year-long extensions until the end of 2017 and of 2018.